Lucifer is rising! Freshly signed on Rise Above Records, the new burning doomy band delivered their debut single "Anubis/Morning Star" full of heavy fuzz and dark vibes, an album is in preparation as well and to know more about it, we had the chance to catch up with Johanna Sadonis to discuss about the band, touring, future projects and occult matters! 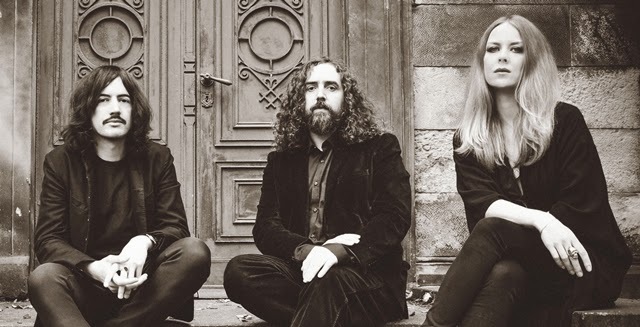 Occult Rock Magazine: Hi Johanna and thank you very much for your time to answer a few questions about yourself and your new band Lucifer! We're really pleased to have you here! Let's focuss on the present and future but to start, could you tell us some more about the background story of Lucifer and its creation? - Thank you, Louis. Pleased to meet you, as Mick would say. Lucifer was born when The Oath died last year. The death of one thing is only the beginning of another. I couldn't sit still with all this energy and formed Lucifer immediately. I got Andy Prestidge on board, who also played drums with The Oath and Dino Gollnick on bass, who was already in the talks to play with The Oath. I started writing material with one of the best guitarists around. Occult Rock Magazine: Who are the wizards behind the malevolent and heavy guitars of Lucifer? - Garry Jennings (Cathedral/Death Penalty) who I wrote the entire album with. Occult Rock Magazine: Can't help thinking about Kenneth Anger's "Lucifer Rising" when I heard about your band. Visually speaking too, the single artwork could be a nice tribute, any comments on that? - You could say that I am influenced by similar ideas and aesthetics as Kenneth Anger on magic, spirituality and philosophy. This is only one fragment though of that universe inside of me. I pay tribute to many different influences but in the end it is yourself that is speaking through your work. Occult Rock Magazine: Having clear influences related to the ancient civilizations and magick as well, how would you describe your approach to songwriting, what kind of subjects matters to you the most? - All that shakes mankind ever since. Death, love, existence, spirituality, the duality of things. I am a very emotional person and my lyrics are quite personal. Occult Rock Magazine: How would you describe your connecion to the darkest vibes of the world, is it more like a visual, theatrical approach or are you having as well a concrete interest in the occult, globally/culturally speaking? - I have a vast interest in spirituality and philosophy. I live my life with a very open heart and eyes and I long for a deep understanding of all things. It is a natural urge that sends me on a journey of lifelong learning which hopefully won't stop until I die. The dark side is one thing, but it is really the duality that I'm interested in. Darkness versus light in any sense possible. Of course a certain terminus/wording I use can stand representative for something personal. Metaphors. I try to translate my life into a different context. Art obscures and abstracts life, sometimes in a humorous or theatrical way of course, but it also helps you to rise beyond and elevate you. It's a great method to reflect and ultimately find keys and answers to the world you live in and yourself. The visual part of Lucifer is a necessary key as well. It's an important part of the ritual to transport the message. Occult Rock Magazine: I've read you're working on the first LP, how is it going, can we expect a similar dose of heavy riffing and lyrical inspirations in the same vein of the single? - We just finished recording our first album in Berlin and are now in process of mixing. The album will be released in late May on Rise Above Records. Thanks to Gaz Jennings you can expect an extra heavy dose of riffing. Lyrically I continue what is already looming on the single, yes. I think we have a very eclectic album here musically and I can't wait to let this record loose. Occult Rock Magazine: Ready for touring? How are the rehearsals going considering you guys are in different locations (Berlin/London)? - At the moment we are preparing for a mini tour early April with Death Penalty in Germany and Roadburn Festival. We are also excited to support Pentagram in May in Berlin. We intend to tour more extensively later this year after the release of our album. This band involves quite some travel indeed. For the album we rehearsed in London, then all flew to Berlin to record for example. It all works out very well and we enjoy the journey of this band very much. Occult Rock Magazine: Do you have a thing for records? If so, could you give us like a top 5 of your most cherished ones? Occult Rock Magazine: I almost wanted to ask the same question as for movies but instead, I will simply ask: what are the last movies you've watched, did you enjoy them or not? - I haven't seen anything lately that really impressed me. My all time favourite must be Polanski's Rosemary's Baby. Occult Rock Magazine: We're really looking forward to hear more of Lucifer's music, thanks again for your answers and those last few lines are entirely yours, feel free to share anything with us that would come to your mind! - It's best to let the music speak for itself. Thank you! Great interview man i love this band already and i loved the oath amazing stuff cant wait!